MANHATTAN, Kan. – Researchers at Kansas State University are hailing a newly-established center to study social media and other online services as an opportunity to help rural small businesses increase their profitability long term. Lauri Baker, associate professor of agricultural communication and journalism, said the Center for Rural Enterprise Engagement was officially launched February 10 to help small businesses score big with new media technology, with the Online Learning Resource launched on September 18. “We are here to conduct research that helps people improve the bottom line of their business and to improve rural economies,” said Baker, noting that much of the Center’s current research represents 2-3 years of recent work. 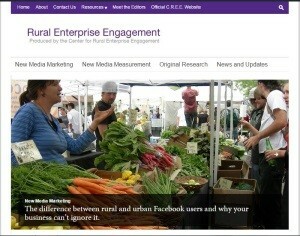 Their findings and other educational content can be found on their online learning resource at ruralengagement.org. “We saw a need for independently-owned rural businesses to learn how to capitalize on new online media technologies in order to advance their business goals,” said Cheryl Boyer, associate professor of horticulture, forestry and recreation resources. Baker, Boyer, and agricultural economics professor Hikaru Peterson are co-founders of the center. Baker said the team members’ backgrounds provide a well-rounded approach to marketing research for business owners. In addition to social media – Facebook and Twitter research is abundant – the team has already looked at other online tools, such as how a small business can effectively use such popular consumer sites as eBay and Amazon. Scott Stebner, managing director for the Center and a former small businessman, says business owners are open to new information and new operations if they make money and aren’t time-wasters. Already, the Center is seeing success. Stebner told of a rural garden center that in two months increased its sales to customers in 20 states by capitalizing on online sales. That same business is now dedicating one full greenhouse to online sales. “The biggest thing when you are working with any small business owner is taking these complex, abstract findings and making them personally relevant,” Stebner said. The Center’s main website is at www.k-state.edu/cree, but interested persons may also email the staff at newmedia@ksu.edu, or call 785-532-1173.